Indeed, social media is playing an ever present part in today’s teenager lives, making them vulnerable to cyber bullying attacks. Nearly 43% of kids have been bullied online. 1 in 4 had it happen more than once. Over 80% of today’s teenagers are using smart phones on a regular basis, which makes them more susceptible to cyber bullying. The cell phone is the most common medium for cyber bullying. Only 1 in 10 victims will inform a parent or trusted adult of their abuse. About 75% have visited a website bashing another student. Cyberbullying greatly impacts the school environment. Females, LGBT youth and students with disabilities are the most vulnerable to these attacks. Unfortunately, the scope of the problem is unknown due to lack of reporting and the fact that many cyberbullies are invisible on school campuses. Most schools are not aware of the efforts of social networking platforms to prevent and intervene in cyberbullying situations. As a result, they do not incorporate online strategies into their anti-bullying policies. Due to the increased awareness of cyberbullying in the school environment and the implementation of new reporting mechanisms, there has been an increase in cyberbullying reports. Unfortunately, this puts a huge burden on school admins to investigate and respond, which may be beyond their capabilities. Despite the active role social media sites are taking in reducing cyberbullying, youths are still reluctant to involve school staff in handling cyberbullying incidents. They fear that the school response will be ineffective and will not exacerbate the problem. 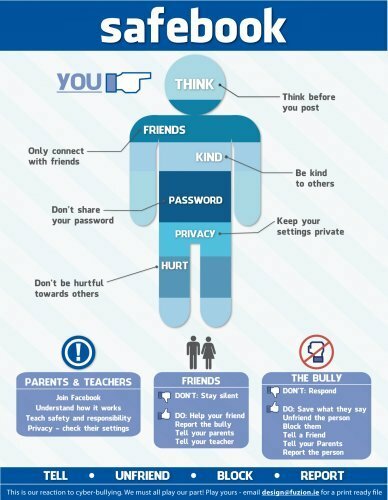 Social Media is always changing and as a result it has left many parents lacking the knowledge and capabilities to educate their children about online safety. Bullying victims are 5 times more likely to consider committing suicide. There are always ways to reduce the risk of being bullied. Here are just ten steps you can take on your own to help someone in need. Educate Yourself: In order to prevent cyberbullying from taking place, you must understand what it actually is. Do some research, learn about how and where it occurs and talk to you friends about what they are seeing and experiencing. Keep Pictures PG-13: Before you send a photo of yourself to a peer or post it on social media, consider if it is something you want others, like parents and teachers, to see. Bullies often use pictures as ammunition to cyberbully enemies. Think before you post: Don’t post anything that could ruin your reputation. People, including employers and peers, will judge you based on how you appear online. As well, don’t give bullies the fuel to drive. Set up privacy controls: Restrict who can see your profiles and images to trusted friends. Don’t add friends you don’t know. Only share information with search engines that are essential. Log out of public computers: Similar to not sharing passwords, don’t give a random person the slimmest chance to share false information on your account. Uncheck the box that says “keep me signed in”. Remove Clichés: When a teacher or parent calls a child by a nickname or labels them as a bully or victim, they place judgment on the child or person, causing the former to be part of the problem. Don’t break the rules: If you see a child on Facebook when they are not supposed to, set clear and enforceable rules and expectations. There is a reason why someone under 13 cannot have a Gmail account and a Facebook profile. If the child is lying about their age to be granted access, put a stop to it and set up parental guidance controls. Don’t reply to messages and requests from unknown users: Equally as important. try to refrain from interjecting on someone’s behalf or getting yourself involved by commenting. Simply report it. Use the block button: The block button is there for a reason, so don’t be afraid to use it if you need to. If the abuse persists, and you have already informed the authorities, you may need to consider temporarily disabling your profile or even removing it altogether. Educate: Work with your child(ren) to handle bullying without being crushed or defeated. Practice scenarios at home on how to ignore a bully or develop strategies for coping with bullying. The ultimate goal is restored self-respect and greater resilience in your child.